1) Q: What is the difference between Astroguard and Astroflex? Astroflex: A polypropylene fabric, with a reinforced sewn edge border. Sold for $5.35 per square foot DIY, custom cut & includes all hardware required for installation. Astroguard: A resin coated ballistic nylon fabric with a heat-sealed edge. 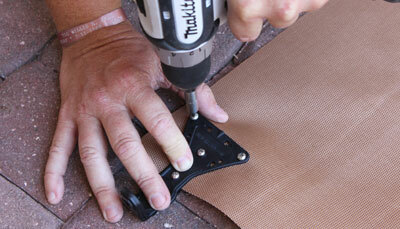 Sold for $6.25 per square foot DIY, custom cut & includes all hardware required for installation. Installed on average* for $10-$12 per square foot (*pricing will vary depending on size of job, surface that anchors will be mounted into & geographic location). *Astroflex requires the extra layer of manufacturing (reinforced stitching) because polypropylene is inherently weaker than ballistic nylon. 2) Q: Will my home owner’s insurance company accept it? A: YES! Both products have an A1 rating with ALL insurance carriers. ASTROGUARD exceeds all International Building Code, Florida Building Code & Miami Dade requirements. In fact, Astroguard recently became the 1st American Made Hurricane Protection System to gain approval in Australia- where testing standards are more stringent. 3) Does the hardware come with the fabric or is it extra? A: Do-It-Yourself pricing includes all hardware required for installation, including a drill bit & driver! 4 ) Q: Is Hurricane Fabric approved for my location? A: see q:2; But, yes Astroguard is Category 5 rated and approved for use anywhere in the world. 5) Q: How long does it take to receive once my order is placed? A: Please call 561-742-3756 for updated lead times. 6) Q: Do you cut it to fit? A: Orders placed on hurricanefabric.com are all custom cut to your specification. Astroguard is also available on the homedepot.com in six pre-cut generic sizes which can be adjusted to your specifications on the job site. 7) Q: How do I get a quote? 8) Q: Is there anyone that can install it for me? A: Yes, we have a global network of dealers eager to assist you. * Please provide your location, # of openings, surface mount & we will have a dealer contact you within 24 hours. In addition, we have an excellent instructional: How to Measure and How to Install Videos on our website which will enable any handy man to get the job done.